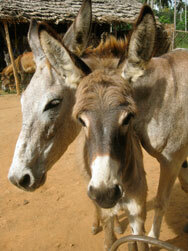 The placement of a donkey’s eyes in its’ head enables it to see all four feet at all times! 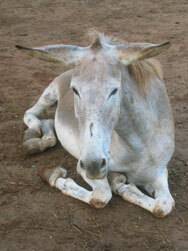 Donkeys have tough compact hooves that can handle sand and rock. Their woolly hair insulates from desert heat and cold. They have a digestive system that can break down almost anything that is inedible roughage. Donkeys can be very jealous animals, by petting one you risk getting a kick from another one nearby especially when it is not a ‘friend’! Donkeys evolved in the desert, because food was scarce. Most donkeys seem to really detest small dogs. HOWEVER, many many people who have donkeys also have dogs. If breeders raise newborn donkeys around dogs, there’s a chance that they can get along nicely. It is said, “It takes a good sense of humor to be owned by a set of long ears”… and …“ If you have purchased a donkey once and love it, another will follow” because they are like potato chips, you can’t just have one! The resulting offspring are sterile, i.e. they cannot produce offspring themselves. Donkey’s milk was once valued as a medicine and was given to premature babies and sick children and to people suffering from tuberculosis. 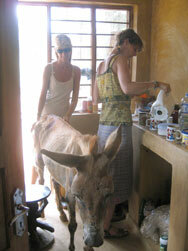 Donkey’s milk contains more sugar and protein than cow’s milk and less fat. In Southern Spain there is a ‘giant’ pure breed of donkey called the ‘Andalucian-Cordobesan’, which can reach up to 16 hands high, that’s as big as a racehorse! 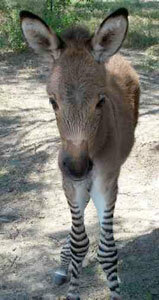 Unfortunately this donkey species is in danger of extinction; a survey in 2000 by the University of Cordobain estimated that there are probably as few as 150 Andalucians left.